Uglyworld #1006 - Alaaaaaaf!!! (Project BIG - Image 66-365), originally uploaded by www.bazpics.com. 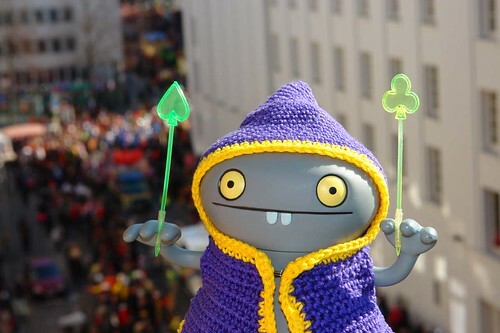 As you already knows on Friday I was lookings out my awesomes Wizarder outfit ready for the bigs Karnevals parader in Aachen which was takings place today. I had so much funs shoutings "Alaaaaaaf" at the tops of my voice, so much so's that I will be luckys when I even can speaks tomorrow, but waits till you see my chocolates and cookies that I scoreds from today, I will makes Baz takes a photo laters to shows you all.